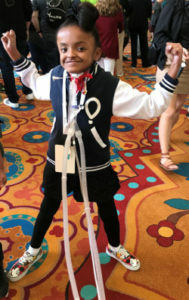 Deonc Bradley is a spirited 10-year-old girl from Houston, TX living with her parents and younger brother. Deonc was born with a rare condition called Jarcho-Levin Syndrome, a skeletal dysplasia disorder that causes issues with her lungs and ribcage. To help her manage her condition, Deonc uses a tracheostomy tube and a ventilator, as well as occasionally needing a wheelchair. Unfortunately, her condition also makes it more difficult to detect other medical threats. During an appointment with a substitute pulmonary specialist, Desiree was asked how they were treating the infection. Desiree said, “This is what we normally do, but this isn’t working.” The specialist suggested they try the same antibiotics and increase the dosage. It wasn’t until early 2018 that Deonc’s regular pulmonary specialist sent her to an otolaryngologist (ENT), who ordered a bronchotomy. This procedure allows the doctor to look into the patient’s lungs using a scope and get a deeper picture than what can be seen on traditional x-rays. During a bronchotomy, doctors may also collect samples, so Deonc’s pulmonary doctor asked the ENT to get a sample from her lungs. The ENT had detected staph growing below Deonc’s trachea, and he told Desiree they should treat it, even though he didn’t think it was the cause of the infection. Within a day or two, the lung sample was tested, and the results showed that Deonc had a very aggressive form of Serratia, an antibiotic-resistant bacterium known to cause respiratory infections. Following the diagnosis, the pulmonary doctor asked Deonc and Desiree to come in and discuss treatment options. He said that the infection had grown tremendously and Deonc needed to be admitted into the hospital. She was in the hospital for two weeks on an aggressive antibiotic. Desiree was told Deonc’s condition was not contagious, but after returning home from the hospital, Desiree also developed sepsis and Serratia. After treatment, Deonc’s infection had cleared, but she was still showing signs of respiratory issues. The doctors determined that because she had the undiagnosed infection for so long, her lungs had been damaged. As a result, Desiree was told that Deonc’s breathing may not return to normal again. Because Deonc had displayed different symptoms in the year and a half that the Serratia was undiagnosed, she was inundated with various antibiotic treatments. But “if we had not been treating her with all of those antibiotics, the infection may have been easier to detect,” says Desiree. She regrets becoming complaisant at doctor’s appointments and not asking more questions. At times, Desiree felt she was viewed as overly cautious because she kept returning to see different specialists. While Desiree does not feel she was treated poorly, she feels she was perceived as paranoid. “Now I look at the timeline, and I wish I had probed deeper,” says Desiree. Desiree is now on various committees at Texas Children’s Hospital including the Newborn Center Family Advisory Committee, of which she is the Co-chair and one of the founding members. She is helping develop language strategies to get clinicians and parents on the same level of understanding. One of the issues she noticed during her experience with Deonc was that she struggled to understand the information she was given. Desiree would like to help bridge that gap between clinicians and patients. She finds that she is asking more questions, like “why are we doing this?” and “what else could we do?” and that she is more involved in her daughter’s care. She advocates for probing deeper and being more inquisitive about the way we do things in medical settings. As for Deonc, she has lost some of her trust in physicians as a result of her delayed diagnosis and the long, painful process of arriving at the correct diagnosis. “By the time we were admitted in April she was emotionally spent to the point where she said ‘I’m tired. I don’t want to do this anymore’,” says Desiree. She notes that Deonc’s spirit is broken because the process dragged on for so long. Although they know it will take some time, Deonc and her mom are working on restoring their relationship with their doctors. Deonc was named a 2015 Champion Ambassador for the State of Texas by Children’s Miracle Network Hospital and has spoken at corporate regional meetings for corporate sponsors, as well as doing promotions and media campaigns. She is attending school, and while she currently needs her chair more than usual, she is hoping to see improvements soon. Desiree Collins Bradley is a Patient Partner working with SIDM’s Patients Improving Research in Diagnosis (PAIRED) project, funded by the Patient-Centered Outcomes Research Institute (PCORI). Read her biography. To learn more about the project, contact Sue Sheridan at sue.sheridan@improvediagnosis.org. The Patients Improving Research in Diagnosis (PAIRED) program is the only of its kind that focuses on the unique requirements of research in the process of diagnosis and the choices that patients face during that process.